From the earliest days of the western frontier, women heeded the call to go west along with their husbands, sweethearts, and parents. While many of these women were attached to the army camps and outposts that dotted the prairies, others were active participants in the skirmishes and battles that took place in the western territories. Each of these women -- wives, mothers, daughters, laundresses, soldiers, and shamans -- risked their lives in unsettled lands, facing such challenges as bearing children in primitive conditions and defying military orders in an effort to save innocent people. 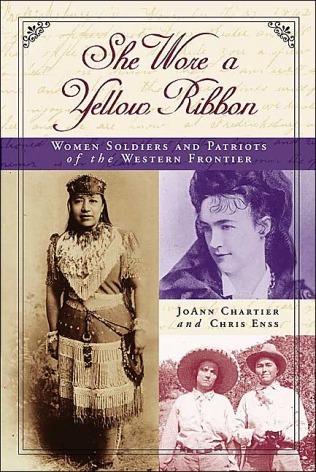 She Wore a Yellow Ribbon tells the stories of twelve such brave women who served their country on the early frontier. These heroic women -- Buffalo Soldiers, scouts, interpreters, nurses, and others -- displayed a depth of courage and physical bravery equal to or surpassing that of many men of the time. Their remarkable commitment and willingness to throw off the constraints of nineteenth-century conventions helped build the West for generations to come. Paperback, c2004, x, 182 p. : ill. ; 23 cm. Includes bibliographical references (p.167-176) and index.